When thinking about drugs, one doesn’t usually associate an environmental impact with the production or manufacturing process, however, the toll on natural habitat is real. From Marijuana grow operations in our National Forests to prescription drugs in our waterways, modern chemistry and drug production is having a profound impact on our world. Gone are the small patches or the small scale grassroots ‘hippie’ farms, instead they have been replaced with large scale slash and burn grow operations with toxic chemicals and fertilizers for maximum production. Left behind are toxic dump sites, full of trash, chemicals and a polluted wasteland. 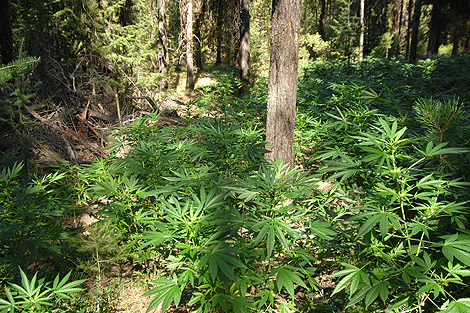 Reminiscent of the moonshiners of old (who are still in operation today) who used the forest to hide their operations, these modern day drug growers have increased in scale and destruction. Nowadays native vegetation is cleared before planting both by hand and by liberal doses of chemicals such as herbicides, rodenticides and pesticides, some of which are banned in the United States. 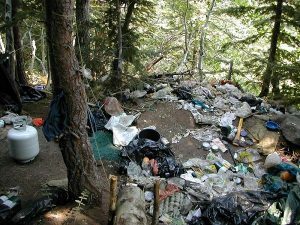 These chemicals contaminate grow sites and surrounding areas, causing extensive and long-term damage to ecosystems including wild rivers and streams. Human waste and trash along with thousands of feet of black tubing transport large volumes of water diverted from streams, lakes, and public drinking water supplies. 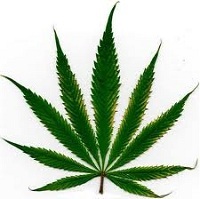 An average size marijuana plot of approximately 1,000 plants requires up to 5,000 gallons of water daily. Increasing concentrations of the rat poison warfarin have been detected in California in a mammal called the fisher (Martes Pennanti), a sensitive mammal nearing endangered status. It’s effects have even been linked to the decline of the endangered Spotted Owl for the same reasons. 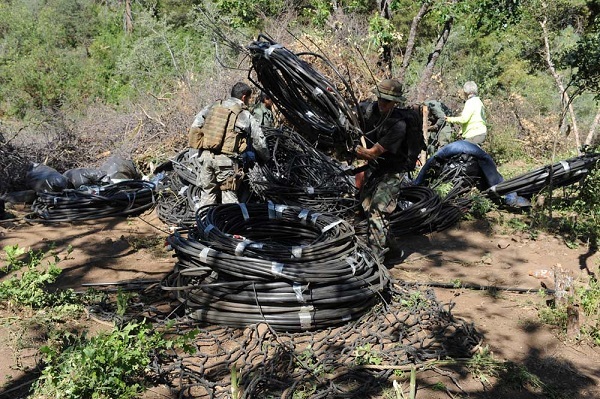 There is also an increasing danger to the rangers and the public as growers with ties to drug cartels can be heavily armed and even have been known to set improvised anti-personnel landmines in grow areas to protect their investments. Solutions are limited as National Park patrols cannot cover such large areas with so few rangers. Serious consideration to legalization (and regulation) of the marijuana trade have been proposed, but as of yet, there is no real action plan in place. What are your thoughts and ideas on the issue?